How did Pablo Neruda really die? Forensic science weighs in. 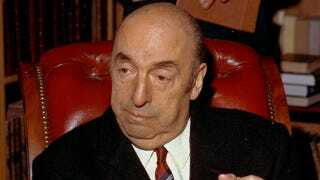 Almost 40 years ago, Chilean poet Pablo Neruda died. Whether the Nobel prizewinner’s death was from prostate cancer (the official diagnosis) or poisoning has been a longstanding mystery. But earlier this week, Neruda's body was removed from its tomb, launching a forensic investigation that could establish once and for all how the artist really met his end. False negatives are possible, says Barry Logan, president of the American Academy of Forensic Sciences, who is not involved in the investigation. “If experts find toxics that should not be there, then the result will be unequivocal,” he says. But some plant poisons are not detectable even in optimal forensic conditions, and traces of cyanide may be artefacts of decomposition, Logan says. “Finally,” he says, “the analysis may say whether a substance is present or not, but quantitative estimations are difficult in these conditions.” A poisoning that consisted of an overdose of a legal medication, such as morphine, would be difficult to detect. It sounds like nobody is expecting any results for at least a few more months. We're not holding our breath, but it'd be nice to see one of these investigations resolve more questions than it raises. Read more at Nature and The New York Times.